Over 72% of the 39 units in the Quays, an exciting new boutique commercial development under construction at Century City, have been sold or reserved since its launch late last year. 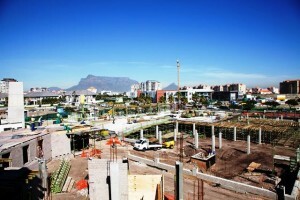 Sedica Knight of developers Rabie Property Group said that to date 20 units had been sold for a total of just under R35million while a further eight, totalling R17,5million, had been reserved with negotiations with purchasers well advanced. The deals completed or under negotiation represents 77% of the total value of units. She said that the low rise studio offices range in size from 41m2 to around 400m2 , excluding balconies, and were priced from around R800 000, ex VA.
“As such it is providing smaller office users the opportunity to purchase in the burgeoning Century City precinct. “The two and three storey office buildings are set around courtyards and a water-fronting piazza and bistro restaurant and have been designed as individual facades rather than a monolithic office block and the varying architecture will give the appearance of a village street edge that has evolved over time. The buildings will be serviced by a lift and will have 140 parking bays including basement parking for tenants and podium parking for visitors. Knight said the Quays had an intimate scale and would embrace both the neighbouring residential developments – Quayside and Quaynorth – as well as the Waterstone complex – and the Central Park commercial node. Knight said the development had appealed equally to investors and smaller owner occupiers such as service providers and professionals looking for an affordable entry into commercial property ownership at Century City. Construction is well underway with occupation expected in March/April 2014.